Greenhill Care Home is set in seven acres of beautiful mature grounds close to the exclusive Hadley Wood area. Formerly a magnificent private country house, Greenhill has retained many of its original features. Greenhill provides a wide range of services from respite to palliative care, all meeting the specific needs of all individuals. Specialist Dementia care is also available for residents who need it. 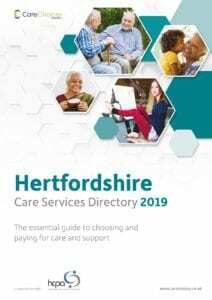 The directory includes information on paying for care in Hertfordshire, supporting carers and checklists to use when looking at Hertfordshire care homes. To obtain a hard copy of the Hertfordshire Care Services Directory, call Care Choices on 01223 207770.